Technical pan film by Kodak is a very high contrast, high resolution film that has been discontinued. 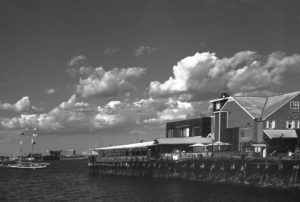 The photo of Anthony’s Pier Restaurant in Boston is an example taken with 35mm Technical Pan film; I’m guessing at 1/60 sec, f16, no filter. If you click to enlarge the image, even the people that originally appeared as specks are still in reasonable focus. The clouds are very contrasty, as if a red 25 filter had been used.